Coterie Press are producing is a very special, limited edition book titled 'The Story So Far' for Lotus Cars USA, to commemorate the last of the current Esprits being built. Lotus USA are receiving the last 75 cars to be built and these are coming off the line as we speak. These cars are all a special edition model  the final edition  with quite a few extra items, and each carries a special build plate on the engine and in the car. Lotus Cars USA have commissioned 200 copies of this hand produced book, which will all go to the USA dealers. Coterie Press are being allowed to print an extra 200 copies to sell here in the UK and Europe. Since Lotus want this book to be kept as an exclusive special edition and they will not be available on general release or in the bookshops, either here or in the USA. The book will be 12x13 inches with 50 single sided colour pages in a hard cover, bound together with screw fixings and will come in a presentation box. 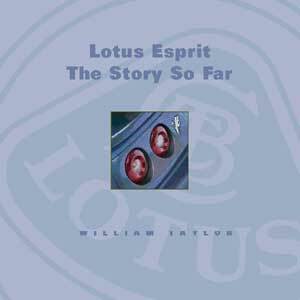 It will feature a brief photographic history of Lotus as well as development of the Esprit, from the prototype and S1 through all the models. It will then cover the last cars being built, with photos on the production line, engine details and studio photography of the finished product. The book will be ready to print by the end of October and should be ready for despatch at the begining of November. The launch for the book to the UK market will be at the Club Lotus meeting at Stoneleigh on the 16th November 2003.